Honorarium provided as per Schedule “C” of the Trust Agreement. Successful completion of Trustee accreditation with the National Aboriginal Trust Officers Association of Canada (NATOA) within the first 9 months of appointment. Details can be found in the “Mohawks of Akwesasne Community Settlement Trust as amended up to this 16th day of May, 2016” – Pages 19-23 Section 4.0 Community Trustees found on the MCA webpage or a copy can be obtained at the Mohawk Government Office. An eligibility list may be created to fill future Trustee positions that may become available. 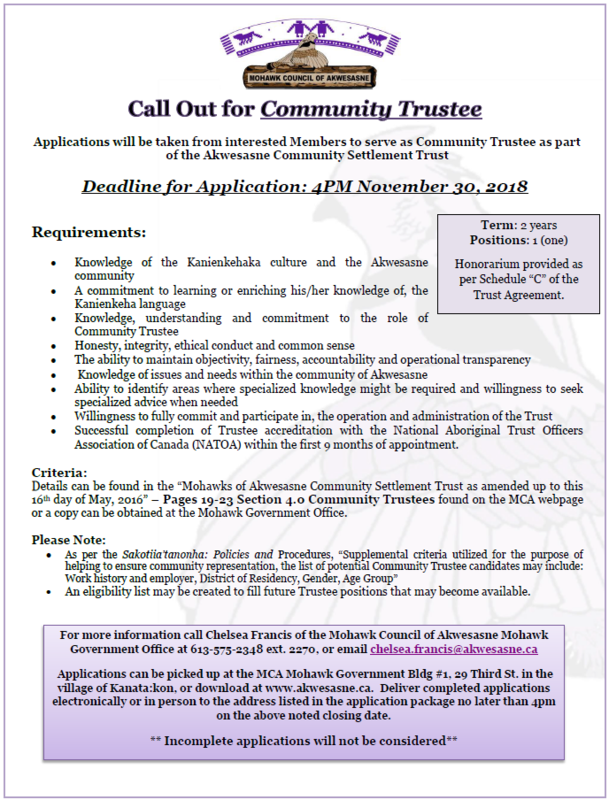 Applications can be picked up at the MCA Mohawk Government Bldg #1, 29 Third St. in the village of Kanata:kon, or download at www.akwesasne.ca. Deliver completed applications electronically or in person to the address listed in the application package no later than 4pm on the above noted closing date.